Manipuri temples follow the Vedic architectural style. The architectural style is also largely influenced by the buildings in Bengal. The amalgamation of the two forms of construction has rendered a rich architectural style to the temples in Manipur. The design of the temples in Manipur displays the traditional style of construction of this north-eastern state in India. The ancient temples are mostly constructed with bamboo which is also a trait of the Bengal architectural style. Parabolic contours are a common feature in most of the Manipuri temples. All the temples in Manipur that are hut-shaped contain these parabolic contours.Manipuri temples that exhibit the parabolic contours in design are Mahabalitemple, Tangal temple and Govindajee temple. Some other temples in Manipur are of the Shikhara style. Some such temples are: Kakching Narsingh, Thakur temple, Krishna Chandra temple at Kakhing Bazar and Krishna temple at Krishnampat. There is one more characteristic of the Manipuri construction style, which is the combination of the two styles of Shikhara and Pagoda. The Kamakhya temple in Hiyangthang Lairenbi has a blend of Shikhara and Pagoda style of architecture. The majority of the Manipur temples and other buildings are built on the Brahmanical rules according to the Vastushastra. The main structure has a square piece of land in the middle, which signifies the Panchratna plan with Lord Brahma in the centre and other gods on all sides. 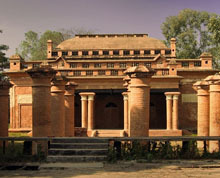 The temples and other buildings in Manipur are made up of brick and mud. Every temple in Manipur has a mandap. The most creative part about the mandapa is the paintings that depict the love story of Khamba-Thoibi, love couple in Manipur fables. As the name suggests, the temple is dedicated to the Lord Krishna, also known as Govinda. According to Hindu mythology, 3 supreme powers controlled and ruled the earth and one of them is Lord Vishnu. Lord Krishna is the incarnation of Lord Vishnu. In the temple of Shree Govindaji, visitors can see the idols of Lord Krishna and Radha, who was his consort. The temple also has idols of Lord Jagannath, another form of Vishnu. Located in an easily accessible position in the state capital Imphal, the temple is visited by large numbers of tourists every year. The shining golden building of the temple attracts tourists, other than regular devotees. Originally constructed in the year 1846, the temple was built in the reign of the Manipur ruler Maharaja Nara Singh. The state faced severe earthquake in 1868, causing massive devastation. Shree Govindaji temple also suffered major damages and the temple building was damaged to a great extent. The temples idols faced damages and lost its original form and splendour. Years later, Maharaja Chandrakirti reconstructed the temple and gave its original form and structure. The lost glory of this Hindu temple was brought back and is at present is one of the visitors' attractions in Imphal. One of the biggest temples in Manipur worshipped by more than 10 lakh devotes every year. 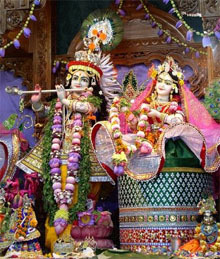 It is famous for the presiding deity Shree Gopinath, the idol of Lord Krishna. annual festivals like Holi, Diwali, Krishnashtami and Durga Puja are celebrated in a gala manner with locals participating in the events along with a large number of devotees who had flocked here from other parts of north-east India. 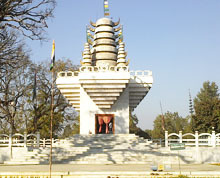 The temple is situated in Imphal town at the compound of Manipur State Road Transport Corporation. The whole structure of the temple is made in bricks. It is a rectangle cube and appears just rising from the ground level. Its pedestal is not raised above the ground. It is facing south. The facade wall is decorated and in front there is a semi-circular arch supported by three pillars on each side. Above the cornice is the railing. The outer jacket cube has got a row of arcades in its eastern and southern walls. There are no arcades in the western walls. The inner sanctum is square and the sanctum wall is provided with three doors. The circumambulatory path is approachable through arcades on east and north sides and through the arch gate from the front side. The floral motifs on the facade wall below the cornice and in the railing show advancement in art expression. The arrangement of pillars, the archivolt with multi-fold curves, the geometric modulation of arch holes, the foil arrangement inside arcades, etc show an architectural improvement as compared to that of the 18th century and the first half of the 19th century temple construction. The temple is located in Imphal at Brahmpur Guru Aribam Leikai, on the banks of the Imphal River. The temple was patronised by King Charairongba and built in the year 1704 AD. The temple is built in bricks. It is given a thick cement coating from outside. The pedestal is raised in three layers of bricks. A sound panel of flying staircases in the south facing facade matches the sturdy structure of the temple base. The sanctum cube and the porch walls separately support the dome like hemispherical roof. The porch dome is shorter in height. The surface of the dome is decorated withthe floral motifs. Above the floral motifs it is shaped in to a short neck to rest the circular crown. The crown further carries two kalasas placed one above the other. The pinnacle above the top vase also carries a Nilachakra. The internal sanctum is interconnected to the porch hall through a small door.The porch hall is divided in to two chambers partitioned by an iron folding door. The porch door opens outside leading to the staircases. The artistic importance of the temple is that there are different idols of Lord Krishna showing different events from his childhood to adult stage. The temple is located in Imphal town in the first Manipur Rifle Ground. It was patronised by king Kulachandra in 1891. The structure is raised on an octagonal base. The southern side has got flying steps. The facade carries a rectangular door. In the octagonal structure each component wall meets the double cornice. The cornice below and above has got a sequence arranged in a line over the octagonal structure. The roof structure is in pyramidal Gothic Style. The arches incline at 45 degree to form a tapering octagonal structure which is truncated by Amalaka-sila, on the top, in a form of a circular disc. It carries a pinnacle. The deity Lord Sanamahi is worshipped in the temple. The rituals are of typical Hindu style. The decoration of deity and puja system is based on Hindu methods. The dress of the priest performing the rituals is very similar to a Hindu priest. The puja performed by the priest daily in morning and evening at appropriate times of Ushakala and Samdhyakala. The structure is made in bricks. There has been a enough effort to explore the artistic designs in constructing the structure itself in a peculiar architectural design and by giving a stylish finish to the double cornice. It is the only temple for animistic faith of Manipur which was constructed particularly to enshrine the animistic deity. The temple is also important for its architectural variety. Shree Hanuman Thakur temple is a highly revered shrine of Lord Hanuman located in Imphal. It stands on the banks of the Imphal River among the groves, Mahabali forest. The temple enshrines a beautiful idol of Lord Hanuman in human form. The idol is carved out on a big slab of stone. 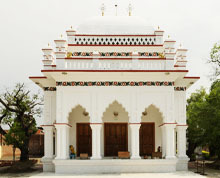 The temple is believed to have been built by King Garib Niwaj in 1725 AD. It conforms to the hut-type of Bengal style. The mandapam located in front of the temple has shadowed the structure of the main temple. Covered with a dome shaped hemi-spherical structure, the sanctum cube is raised as a rectangular structure up to roof. A double lotus in a criss-cross pattern rests at the top of the roof. Kalasas are placed over the crown. Above the kalasas, there is a vase which holds pinnacle with Nilchakra. Shree Hanuman Thakur temple is a memento of the Ramanandi cult of Hinduism in Manipur. Nityananda (1474 CE), was a Vaishnava saint and famous as a primary religious figure within the Gaudiya Vaishnava tradition of Bengal. He is also considered an avatar of Balarama, cousin of Lord Krishna. According to Gaudiya-Vaishnava tradition, Nityananda is an incarnation of Balarama, with Chaitanya Mahaprabhu being his eternal brother and friend, Krishna. Nityananda Prabhu was born to a religious Brahmin, known as Pandit Hadai Ojha and Padmavati in Ekachakra, a small village in Birbhum district of West Bengal around the year 1474. Narasimha is an avatar of Lord Vishnu (Krishna) and one of most popular deities as evidenced in early epics, iconography, and temple and festival worship for over a millennium. Narasimha is often visualised as half-man and half-lion, having a human-like torso and lower body, with a lion-like face and claws. This image is widely worshipped in deity form by a significant number of Vaishnava groups. Vishnu is believed to have taken the avatar to destroy the demon king Hiranyakashipu. Shri Radha Krishna Chandra Manimandir is the centrepiece of the University of Bhagavata Culture, ISKCON in Manipur. This beautiful temple is constructed by Bhaktisvarupa Damodara Swami Sripad Maharaj (founder-rector of the University of Bhagavata Culture and International) director of the Bhakti Vedanta Institute. Manipur is a place where Lord Krishna is held in very high esteem. He is the one Hindu deity who has a place in all Manipuris' hearts. It was, therefore, no wonder that Imphal had its very own ISKCON mandir.